Former Jersey Shore Boca club standout and Stevens Institute of Technology senior Nick Gkionis was named a first team Division III All-American by the National Soccer Coaches Association of America on Thursday. The standout defender was a member of the Boca U23 and U20 teams during his college years as well a member of the Boca’s Super Y-League teams earlier in his career. 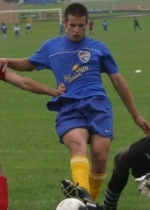 HOBOKEN, N.J (December 10, 2006) – Former Jersey Shore Boca club standout and Stevens Institute of Technology senior defender Nick Gkionis (Jackson, N.J.) was named a first team Division III All-American by the National Soccer Coaches Association of America (NSCAA) on Thursday. Gkionis is the second men’s soccer player to earn first team All-America honors. Former teammates Brian Marks (Yardley, Pa.) was a first-team selection in 2004, while Giuseppe Incitti (River Edge, N.J.) was a second-team selection in 2002. The Boca alum was also named to the All-Metro first-team for the second-straight year after anchoring a Stevens’ defense that allowed only 15 goals in 2006. He ended his final season with nine goals and eight assists for 26 points. Gkionis, a 2003 Jackson Memorial graduate, was the team’s fifth-leading scorer in 2005 with 28 points. He was an All-Skyline selection in 2004 and 2005. In the 2005 conference championship, he netted the game-winning goal in double overtime against the U.S. Merchant Marine Academy and was named the tournament MVP. That same year he was an NSCAA All-Metro first-team selection. The Skyline Conference Player of the Year, Gkionis helped Stevens to an 18-0-3 unbeaten season and its fourth-straight Skyline championship and NCAA Division III Tournament appearance. Stevens also advanced to the Sweet 16 of the NCAA Tournament for the fourth year. The Ducks were ranked No. 10 in the nation in the final NSCAA Division III poll.